Below are several of the residential real estate options for condo living in downtown Raleigh for those looking to purchase a home. Overwhelmed by the choices? That's where a good buyer's agent can help. 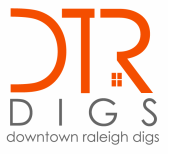 Contact a Metro Digs agent today and we can help you navigate your options for living downtown or nearby. ​Did PNC Plaza maintain its position as highest price per SF downtown? ​Check out the latest stats in this summary of 2017 condo sales. The Hudson Belk department store was converted to 64 condos in 2005. Modern with concrete floors and exposed beams and brick, these condos truly give you a blank slate to build your home. Retail on the first floor houses the ABC11 TV studios, Sona Raleigh (sushi), and the UPS Store. PNC Plaza Condos - The tallest building in downtown Raleigh (formerly RBC Plaza Condos). Residential living starts on the 23rd floor. Amenities: Extensive outdoor common area with pool, fire pit, and grilling area, Fitness Center, 24 hour security, Movie Room, Club Room with pool table, kitchen, foosball, and poker tables. The Atrium - Located on Fayetteville Street, the Atrium condos rarely come on the market. Luxury townhomes located across from Wiley Elementary School off St. Mary's St.
Mixed use project with a premium location on Glenwood Avenue close to many restaurants and shops. Finished in 2008, the building has 117 condos. The Paramount - Pure condo living, the Paramount does not share space with retail or commercial tenants. Amenities: Pool, fitness center, club room, grilling area. Located steps away from Starbucks, Mellow Mushroom and other Glenwood South hot spots, the Paramount is a popular building. Known for its rooftop pool, West is 16 stories tall with 177 units. Don't want to take an elevator to your home? Consider a townhome. West Lane townhomes seldom come up for resale, so if they do, be ready to move fast! 510 Glenwood - One of the first condo buildings to start the Raleigh Renaissance, these 36 condo units offer some of the largest balconies available downtown. If you want outdoor space, this should be the first place you look. True luxury living with top of the line finishes in all units. The only condo building downtown to have gas cooktops. Elegant row homes with rooftop terraces are now under construction east of Moore Square. A mix of townhome and condo flats, Palladium keeps you close to Fayetteville Street but you'll feel like you have your own community with City Market and Moore Square a block away. Built in the 80's, Founders Row features one and two-story plans and is right across the street from City Market. Still one of the more affordable places to live. One of a few buildings to include three bedroom floorplans in addition to one and two bedroom units, the Dawson features a few retailers on the first floor, most notably the Borough. Built in the 90's, the condos at Martin Place are some of the more affordable condos and offer covered parking. Built in 1999, Park Devereux was a pioneer in the downtown condo market. All condos with no retail, Park Devereux overlooks beautiful Nash Square. Technically located just west of the Warehouse district, Bloomsbury Estates sits up on a hill with a great view of downtown. It is just outside downtown-proper, and has a more residential feel to it, while you still get the convenience of condo living. A 5 block redevelopment project with live/work units, historic single family homes, row homes, and carriage houses, Blount Street Commons will help unify downtown with historic neighborhoods like Mordecai and Oakwood. 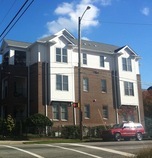 Across from Krispy Kreme on Peace St are 17 townhome style condos. A few have rooftop terraces. Located in between downtown and NCSU campus on Hillsborough Street. Next to the historic Joel Lane house, the townhomes are walking distance to Glenwood South and the Warehouse District. Located across the street from Charlie Goodnight's comedy club, Ellington Oaks is a cluster of 12 townhomes. Located on New Bern Ave just outside of the Oakwood district, these ten townhome style condos offer amazing rooftop views of downtown. Real loft living in a converted mill with high ceilings, exposed brick, old wood floors, and original beams. Live downtown for under $200,000. Located just off Person Street on the edge of Historic Oakwood. On the corner of Glenwood and Hillsborough Street, these efficient units are close to Glenwood South, the Warehouse district, and NCSU. Tucked away within the Mordecai neighborhood, these townhomes are new and provide plenty of space for those looking to live close to town on a budget. Surrounding Fletcher Park are several communities. It's a great location - only blocks to Glenwood South and a short walk to Cameron Village. Recently announced plans for row homes and a small condo building on South Street indicate more dense residential options in Boylan Heights. Enjoy living in a historic neighborhood but in a new condo. Three bedroom units, but small quantity and few resales available. Luxury condos built by the same folks who brought you Fairview Row in Five Points. Located just off Wade Ave near St. Mary's intersection, putting you walking distance to Cameron Village and Five Points. Who says you can't live downtown for under $200,000? The Cameron Village townhomes are selling under $200k and are two bedroom, one and a half bath floor plans, with a few flats. Walk to the shops and restaurants of Cameron Village and be just one mile from downtown. Located south of downtown, Caraleigh Mills is close to the Farmer's Market and NCSU"s Centennial Campus. Finished in 2016, modern condos on the corner of St. Mary's and Wade Ave. Located between Glenwood South and Five Points, these townhomes are affordable and give you the option of walking to Five Points, Cameron Village, and Glenwood South. Located on the corner of Peace and Glenwood, these townhomes are some of the few places with 2 car garages. View active listings.